I`m sure we will get the usual "I love it! " and " i hate it " posts but i think it`s fantastic! A cracking meeting and we could see one of the shortest priced favs in years winning the National. And we call ourselves horses lovers .!!!! The winning owners and connections will celebrate wildly no matter how many horses are injured or have to be put down . Lets hope all the horses make it home safely . Its Tuesday and if i had not read this thread you would not know that the National is this coming weekend. Nobody talking about it here. ...no favourite has won since Don't Push It and AP McCoy in 2010, and, in the intervening years, the average winning odds have been 28-1. ...Jury Duty, a horse trying to add victory at Aintree to his win in October's 'American Grand National' at Far Hills, New Jersey, a feat only achieved once previously, by Battleship in 1938. ...Trevor Hemmings looks to have two lively chances of becoming the leading owner of GN winners with Vintage Clouds, last season's Scottish Grand National third, and Lake View Lad. Both horses are grey and nine years old - historically, the best age to be a winner - and the similarity doesn't end there as they both come to Aintree in good form after finishing in the frame - second and third respectively. ...the Irish challenge is looking more formidable than ever with Pleasant Company, because of his previous form when a narrowly beaten runner-up behind Tiger Roll in 2018, Rathvinden, recently successful at Fairyhouse, and the Leinster National winner Pairofbrowneyes. Mall Dini has some form, but over hurdles, and the best entry in the formbook by any runner in the race is that held by another Irish hope, Anibale Fly, runner-up In this year’s Cheltenham Gold Cup. Incidentally, Anibale Fly isn't McManus' sole Gold Cup runner-up in the field - 2017 second Minella Rocco is rated a solid outsider. ...It took Scotland 28 years to win a second Grand National when One For Arthur took the prize in 2017, but Wales has been waiting a damn sight longer for win number two - 114 years - with Joe Farrell, winner of the 2018 Scottish Grand National. It might be a Wales double with the 1st leg being the Six Nations. Last Edit: 2 weeks 3 days ago by Mac. Rolling Sones’ Ronnie Wood will miss out on having his first runner in Saturday's Grand National as his horse Sandymount Duke has suffered a minor "setback". Tiger Roll is obviously where the heart is but shame, I think the little chap is going to battle with all the weight but he is as game as they come and I’ll be shouting him home. I might have a few Rand on Go Conquer at a big price but still looking through the field. A lot to take in and process. If Aintree gives us half the winners we had at Cheltenham, it'll be one to remember. Word of advice - halve your stakes from Cheltenham as many of the top horses have already ran their peak race of the season and come here after putting in their best there and having to run in competitive grade 1's again. Therefore, many shock results usually occur at Aintree. But we'll give it a good crack as usual. An absolute lovable mare who always runs her heart out. Looking to make it 5/5 over fences this season and has a great chance of doing so. She skipped Cheltenham which does not play to her strengths to come here. She will be fresh as a daisy and her form is rock solid - she beat Topofthegame (RSA winner) and Santini (RSA runner up) at Kempton in December. Good chance. A cracking novices hurdle contest between the Triumph hurdle winner Pentland Hills and the Fred Winter winner Band of Outlaws. Having backed both at Cheltenham, this is a toughie to choose as it will be very close between them but going to side with the former. Won at 16/1 at Cheltenham and survived a mistake at the first hurdle to win where he quickened powerfully. He looks a top sort in the making. Of course Band of Outlaws has a super turn of foot and Aintree could suit him even better. Also keep an eye out on Christopher Wood who's the unknown. 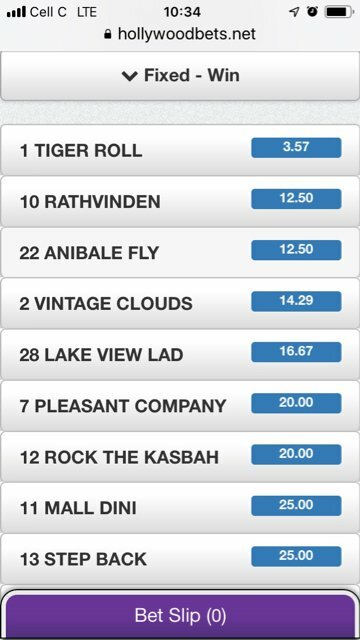 Cracking race. One of my favourite chasers in training who has been a revelation this season when he soundly thrashed a top class field in the King George before finding the gruelling Gold Cup too much at Cheltenham. He will find Aintree much more to his liking with the flatter track. The drop is distance is perfect. He oozes class and if he's over the Gold Cup run, he'll be bang there at the business end with a clear round. 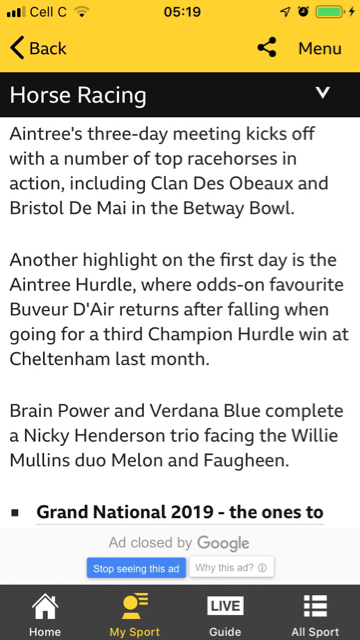 Also will be good to see Buveur D'Air get back to winning ways after his unfortunate fall in the Champion Hurdle. At 9/10, he's a bit short for the straight win but he'll go in multiples. Last Edit: 2 weeks 3 days ago by MasterOfMyFate. Richard Johnson to get the punters off to a flyer in the first.